***As a Southern girl, I just can't resist fried chicken every once in a while. 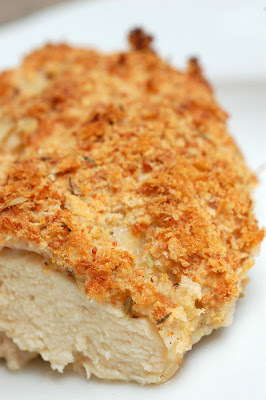 It doesn't get much better than chicken marinated in buttermilk, breaded with fresh bread crumbs, and then fried to a perfect golden brown. However...the one thing that does get better (well, at least healthier!) is when the chicken is baked...instead of fried. This recipe is the perfect combination of both worlds. You get that delectable crunch that fried chicken has, but without all that extra grease and fat! The addition of Parmesan cheese to the bread crumbs does add a few extra calories, but it adds a great flavor to the finished dish. I found this recipe in Martha Stewarts' Everyday Food: Great Food Fast cookbook. I can't say enough good things about this particular cookbook. It's divided by seasons, so it really makes it easy to cook according to what ingredients are in season at that time. The recipes are all really simple but certainly deliver on taste. I've probably cooked more recipes out of that book than any other on my shelf. Preheat oven to 400 degrees. Generously rub a baking sheet with oil. In a food processor, pulse bread until it turns into coarse crumbs. Place chicken in the buttermilk mixture, turning to coat evenly. Working with one piece at a time, remove chicken from liquid, letting excess drip back into bowl; dredge in the breadcrumb mixture, turning to coat evenly. Place coated chicken pieces on prepared baking sheet. Bake until chicken is golden brown, about 35 minutes.Note: Leave enough space between the chicken pieces so that they crisp evenly all the way around. Pecan Caramelized Brie - Easy & Incredible!